The dining room has floors! Seriously, there is so little going on that when I see any change, it’s thrilling. To take this photo I stood in the kitchen and aimed at the dining area. You will see that there is no window, so we won’t be turning on the heat any time soon. But those crates of stone out in front of the house are slowly becoming flooring. 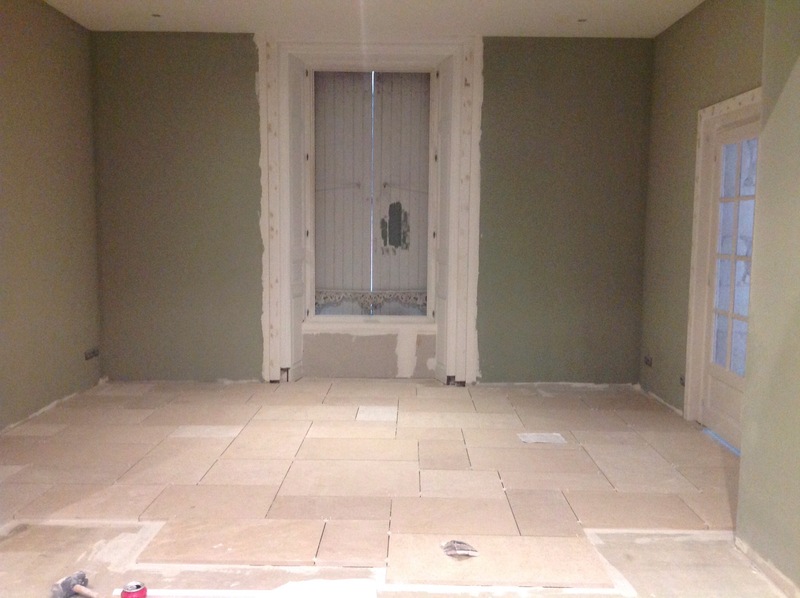 There is a good chance that the flooring will be complete before the windows go in and the heat goes on. This will be great. It is genuinely freezing now, so if we can heat that stone slowly, allowing it to expand slowly, it can only be to the good. This is Pierre de Bourgogne, different colors because it has been rained on and, to various degrees, is wet. It will dry to the lightest color you see. Then it will be sealed, which will darken it again and maybe slightly yellow it. Then we’ll cover this whole area up with an oriental rug and some furniture. You will never again see as much of this floor as you see right now, so enjoy. Is that the new wall colour? Yes. I think it is Little Greene’s Normandy Grey. Looks slightly greenish in that photo. It is green, a sort of gray green. I was looking for more of a true gray. I found one for the entry but in the end I thought this would be nicer in a room that will contain a lot of reddish wood. So are we talking cherry? Yes, these beautiful cherrywood chairs that I brought from California. I live in hope that the effect will be stunning. The kitchen in California was cherry. It is lovely but I’m wondering whether I wouldn’t prefer to have these cabinets painted white, like the ceiling and trim, or a dark gray, as the stove will be black. Maybe that’s too much dark, I don’t know. I’m leaning toward white, too. So what about the stove then? I’m getting a Lacanche, I think it is. They come in colors, though black is standard and would go well with cherry. Make that white, if I go with white cabinets? Trev says which Lacanche? He is toying with that make. Personally would like white or cream cooker . I don’t remember which model but it has two ovens. The cooktop has a grill, or maybe a griddle, I forget. If it has a griddle, it has an attachment that will raise up your steak or whatever. In California I used both ovens all the time and really liked having a smaller one to heat plates and all. I miss having a grill indoors. It makes it so easy to eat healthy food. I like Lacanche because it is still family owned and small. Made in France doesn’t impress me but I do like artisan-made, small business, that kind of thing. Progress is slow bur sure – it’s coming together well. How come nobody tells us that? !